Artist Liam Filson has selected Vitrabond aluminium cladding from Fairview for his sculptural display at the award-winning festival VIVID 2017. 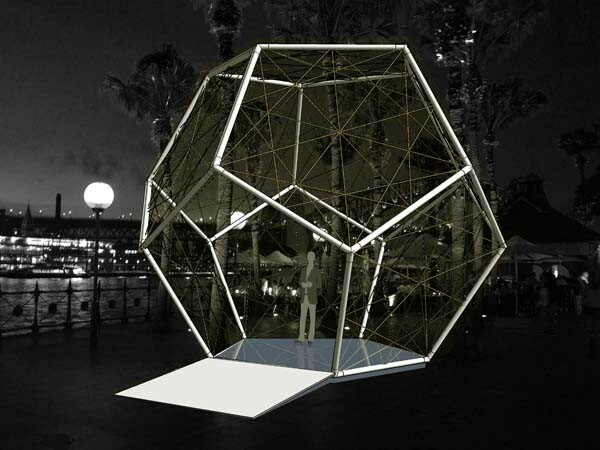 ‘Hedron Bulb’, the sculpture, will feature Vitrabond cladding in the form of hexagons made from the popular Anodised Mirror finish. The sculpture will have prime position outside the Opera House during the festival. Having come across Vitrabond at a recent architectural industry event, Liam, who is also a graduate architect, found it to be an extremely versatile product that could provide the perfect finish for his sculpture. A major feature of the Hedron Bulb's design and its mission is “to leave no footprint, with no remnant of what was, only that which can become something else”. Liam has designed the sculpture to be fully reusable. Liam plans to turn the Vitrabond Anodised Mirror hexagons into a sparkling dodecahedron ottoman. Visitors enter the sculpture to see Sydney Harbour framed through twinkling lights and get captivated by reflections of light, people and places bouncing off the mirrored floor. Fairview's Vitrabond has been utilised in various non-traditional applications including a project in Sydney's Mosman where it was used to imitate standing seam; as the splashback in a kitchen installation; and even as an alternative to tiling in a bathroom.